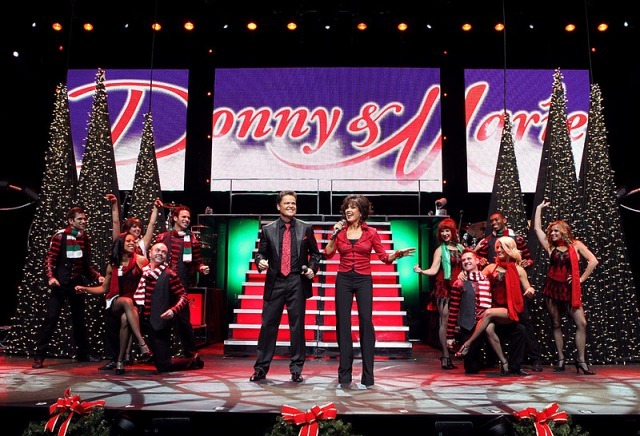 Chicago Like a Local: Donny and Marie take Chicago by (snow) storm! A preface: this Branson-meets-Vegas spectacle gave me a headache. But the audience loved it. Of course. And, I’ll admit: it had its moments, mostly thanks to Mr. Osmond’s disarming charms. Maybe I’m just not cut out for these types of shows? There were many eye-rolling moments, such as when Ms. Osmond introduced the overdone, pseudo-operatic “Pie Jesu” by actually saying, “I have the unique ability to sing many different styles of music.” My eyes nearly rolled out of my skull, down the aisle, and up on the tackily adorned stage to join the ’70s icon (who looks great by the way). But there were also times when she was refreshingly droll and self-aware. More of that, please. Oh, and imagine my surprise when Mr. Osmond introduced the Broadway segment (yes, it’s a Christmas show, but neveryoumind) by saying, “We’ve had the privilege of being invited by some of the most well-known composers to star in their musicals on Broadway.” As far as I’m aware, Marie’s only starred on Broadway in a mid-90s revival of The King and I. I wonder what Rodgers and Hammerstein have to say about that? But man, that Donny is a charmer. Cute, cute, cute. I watched The Donnie & Marie Show as a kid… and loved it! I never thought Donny was hot until “Joseph and the Amazing Technicolor Dreamcoat”. I’m glad to hear he’s still got it in his fifties!